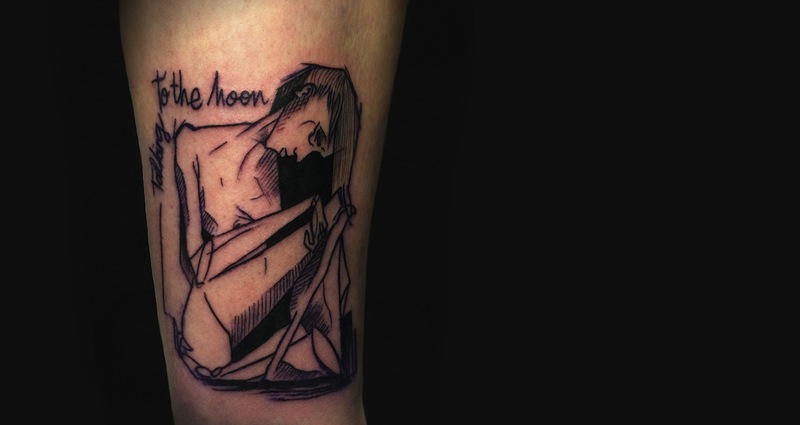 Finding the right tattooer is tough. Popular artists are easy to find, but almost impossible to book. Smart clients keep an eye out for newcomers: fresh talent with smaller followings, but growing portfolios. For top quality with a shorter wait list, forget all about who’s hot right now. Focus instead on who’s rising behind them. 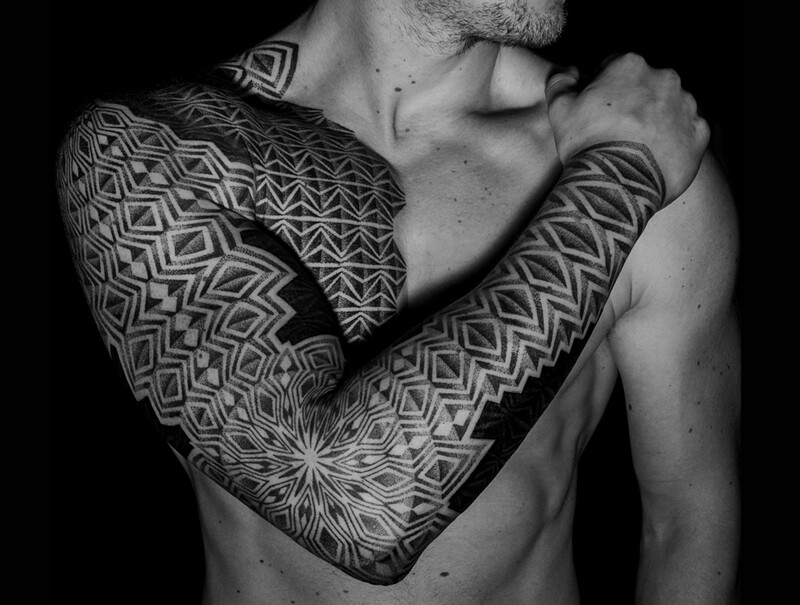 Top: Geometric tattoo by Uls Metzger (as acidouss). 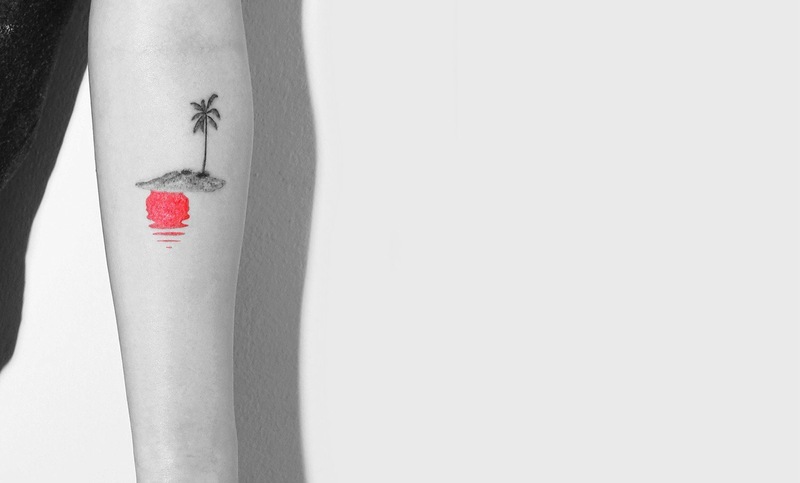 Single needle, micro palm tree tattoo by Kaiyu Huang. Wunderkind Kaiyu Huang is still in school, and already being called New York’s Dr. Woo. But don’t pigeon-hole him just yet: micro tattoos are definitely in his wheelhouse, but he also enjoys much larger pieces. Inspired by Greek and Roman architecture, ancient philosophers and scientific illustration, this Parsons student shows us something new every day. Keep a close eye on this master-in-the-making. 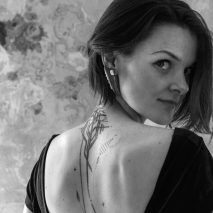 An Italian street artist as a teen, Awer evolved into a professional graphic designer and art director. 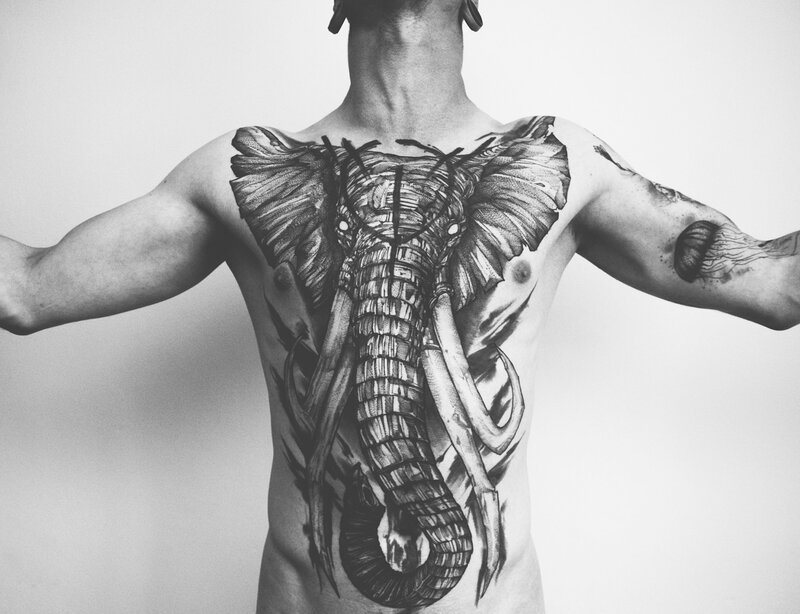 Traveling through Europe, taking part in urban art festivals, he was inspired to work with the medium of skin. 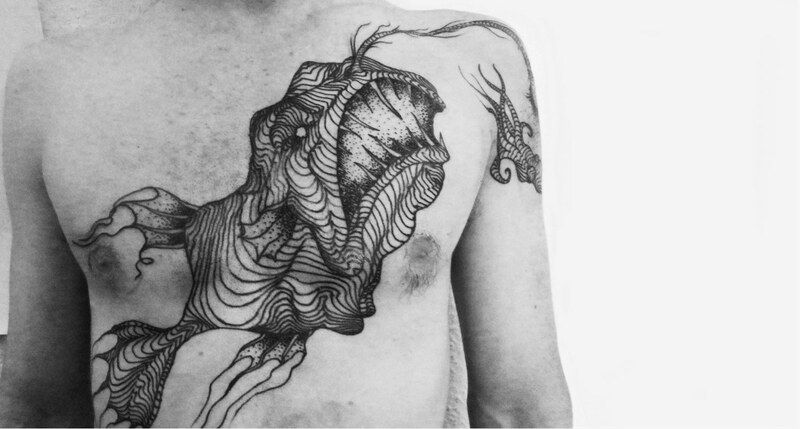 His winding, hypnotic linework distorts the body to look constantly in motion. 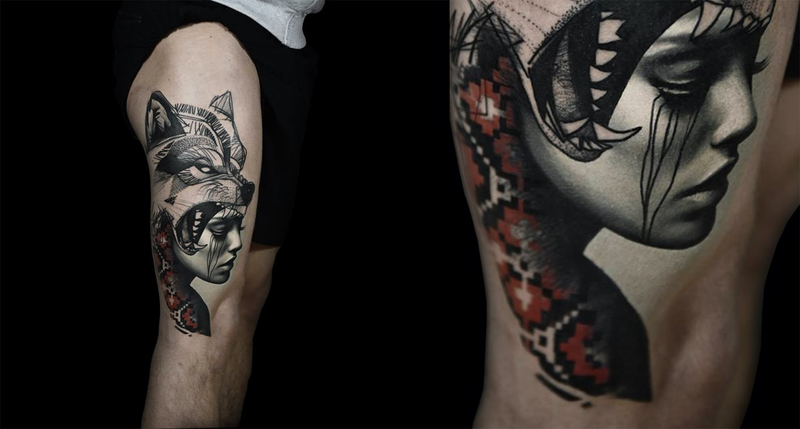 Mesmerized by magical concepts, he loves tattooing deep sea creatures and mythological characters. 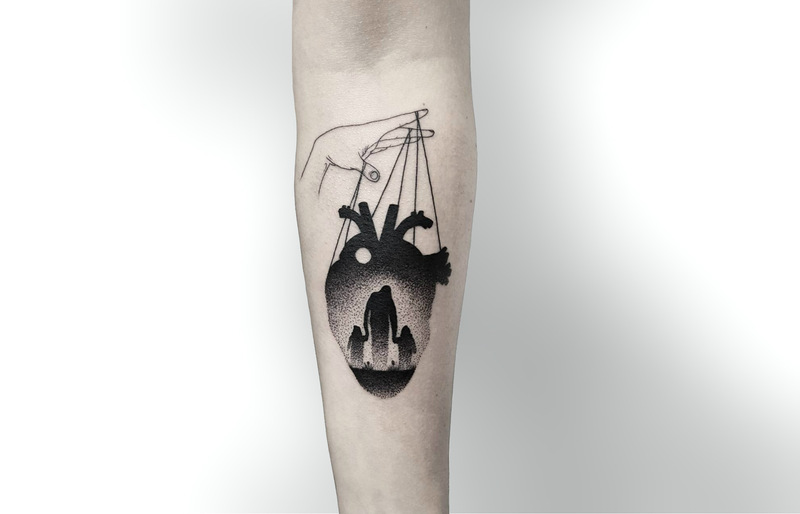 Now based in Berlin, Awer hones this new craft at the private tattoo collective, Ocho Cuervos. 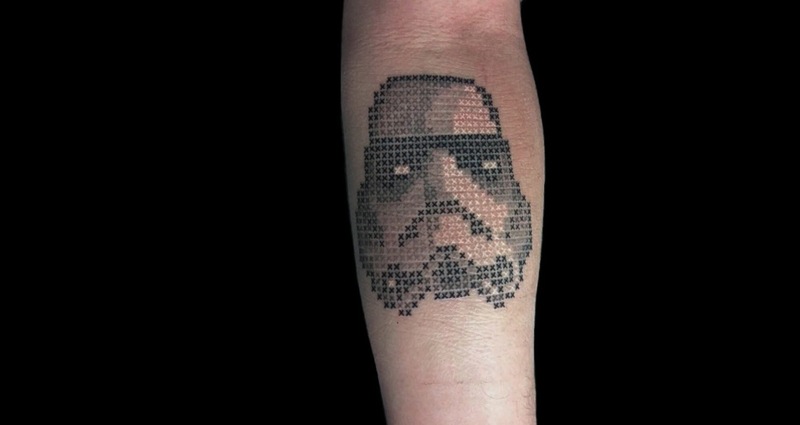 Cross-stitch stormtrooper tattoo by Eva Krbdk, for her fiancé. 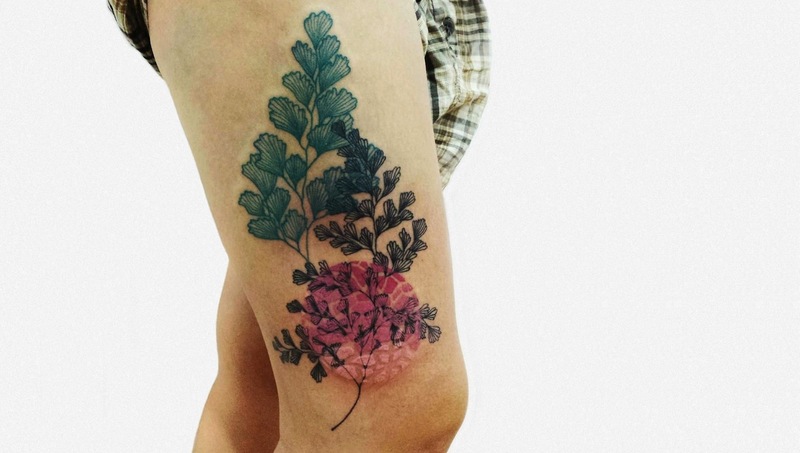 Turkish tattooer Eva Krbdk became a viral sensation with her cross-stitch tattoos. She’s not the first to use this technique, and it’s not her only specialty. (She’s actually been sampling the gamut of styles, from watercolor to stippling.) Krbdk’s life is changing a lot this year, planning her wedding and starting fresh in Istanbul. As she settles into this new rhythm, expect to see a more focused aesthetic. And no matter where she ultimately lands, her steady hand will deliver precision every time. 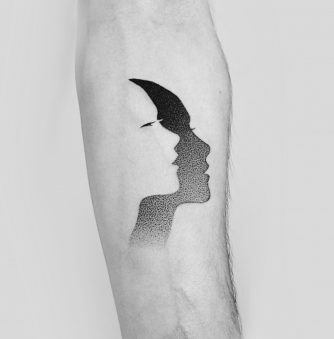 Typography graphic design tattoo by Elizabeth Or. 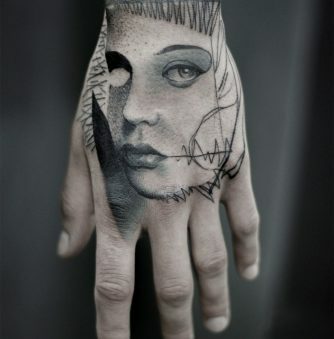 Tattoo Temple is one of Hong Kong’s top studios for modern techniques. 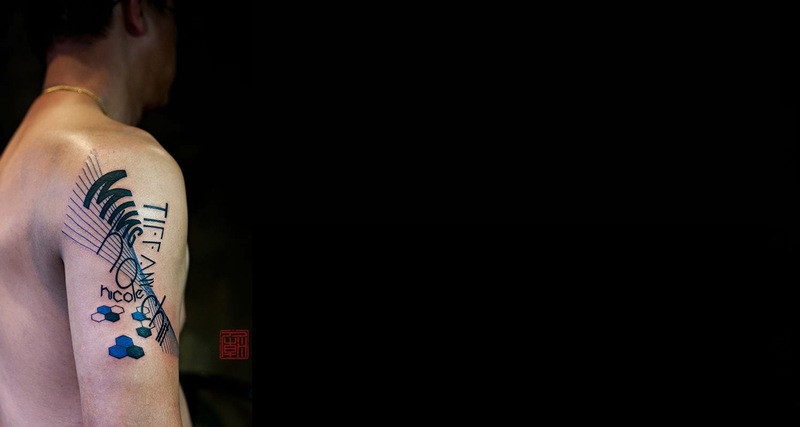 Elizabeth Or, an apprentice under the renowned Joey Pang, is detail-oriented and precise. Experimenting with many styles, she offers a wide range of options from micro fine lines to large-scale stencil prints. With a “gracious and naturally attentive demeanor,” she guarantees a great experience along with a great design. 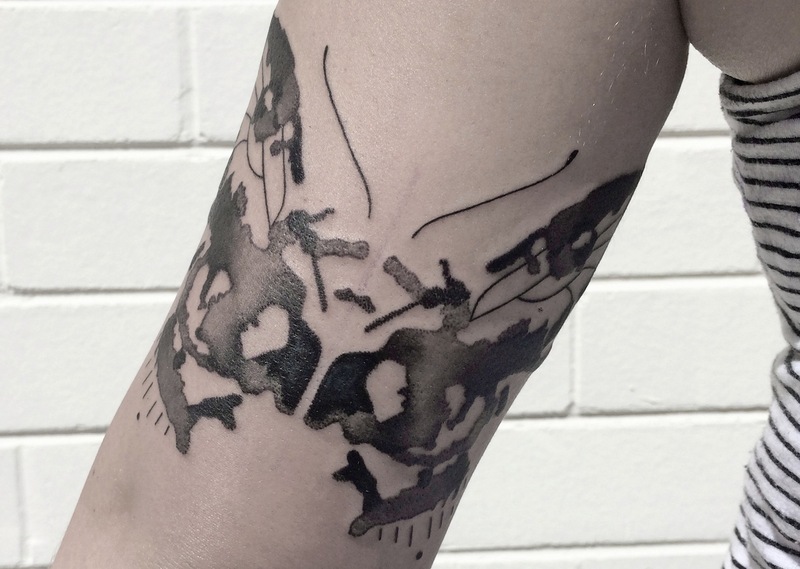 Rorschach test tattoo by Lee Stewart. “I’ve been wanting to do Rorschach tests for a long time now, and am going to develop that idea further [this year]”, announces Berlin-based artist, Lee Stewart. 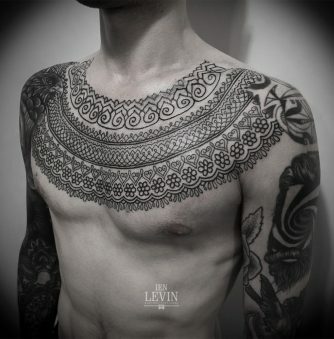 With more tattooers in the community than ever before, it’s getting harder to really stand out. As a result, many are narrowing their focus, opting for the niche-within-a-niche route. And for Stewart, crafting designs with a fixed shape, no shape, and any shape all at once, her work is becoming instantly recognizable. 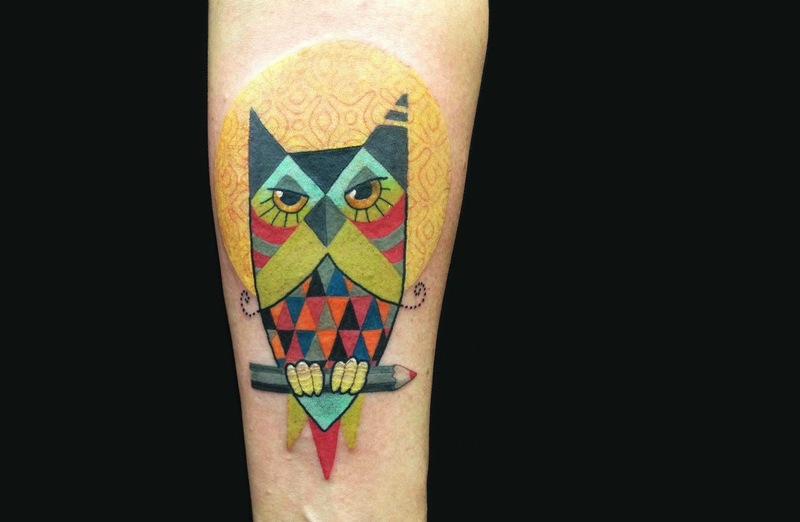 Owl tattoo by Amanda Chanfreau. Swedish painter, visual artist, textile worker and sculptor Amanda Chanfreau has an impressive resumé. With four diplomas in various art disciplines, her work has been featured in both Group and Solo gallery exhibitions worldwide over the last decade. Never complacent, and always hungry to keep growing, she began a tattoo apprenticeship this past winter at Malört in Malmö, Sweden. 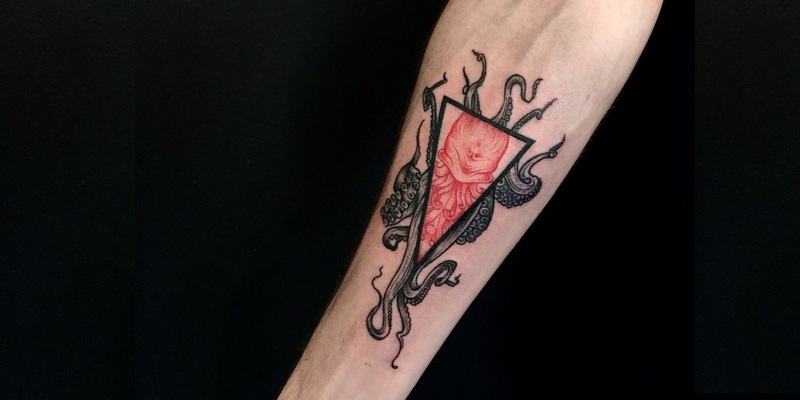 Squid tattoo by Mafis Fischerová. 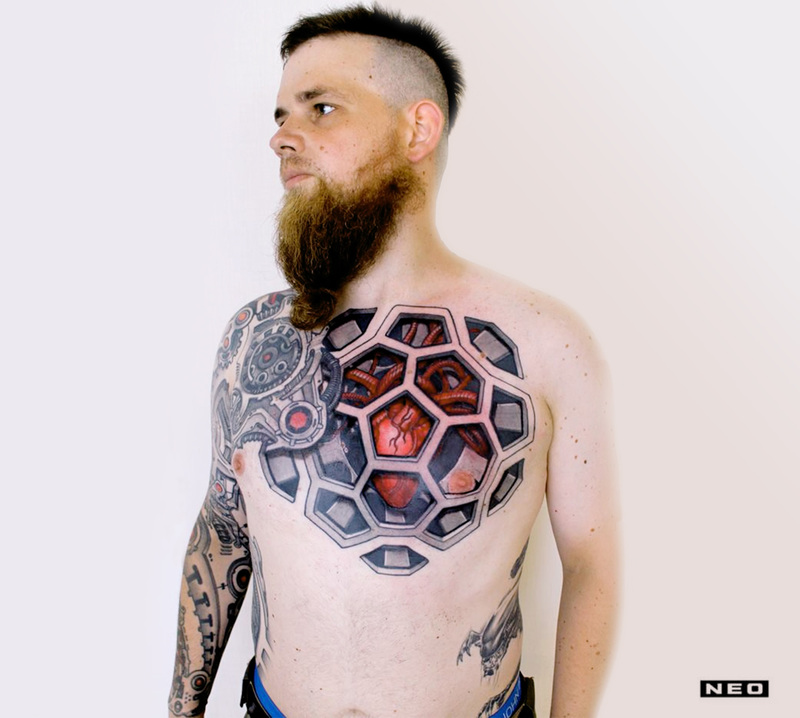 Czech illustrator-turned-tattooer Mafis Fischerová is barely 21 years old, and already works guest spots at the prestigious Bobek Tattoo in Prague. A graduate of the fine arts academy FaVU VUT v Brně, Fischerová went on to work for Tetování Magazin before picking up the rotary herself. Her designs often include geometric and cubist elements, applied to natural subject matter, for a permanent union of the organic and inorganic worlds. 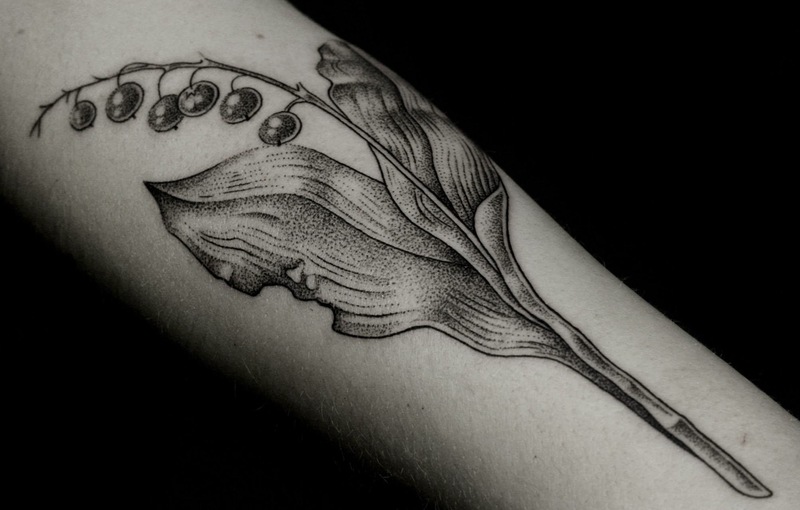 Fern tattoo by Aline Wata. 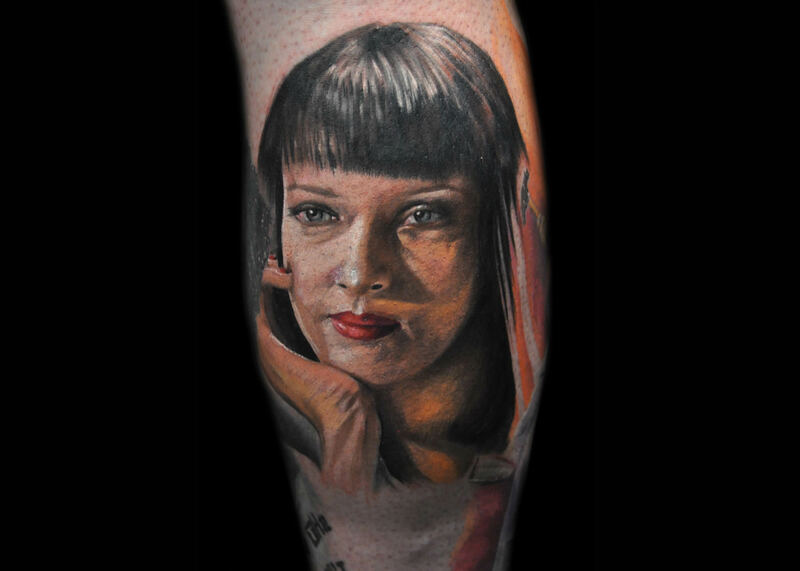 An unlikely candidate for tattoo work, Aline Wata credits the modern tattoo movement for her sudden career change. 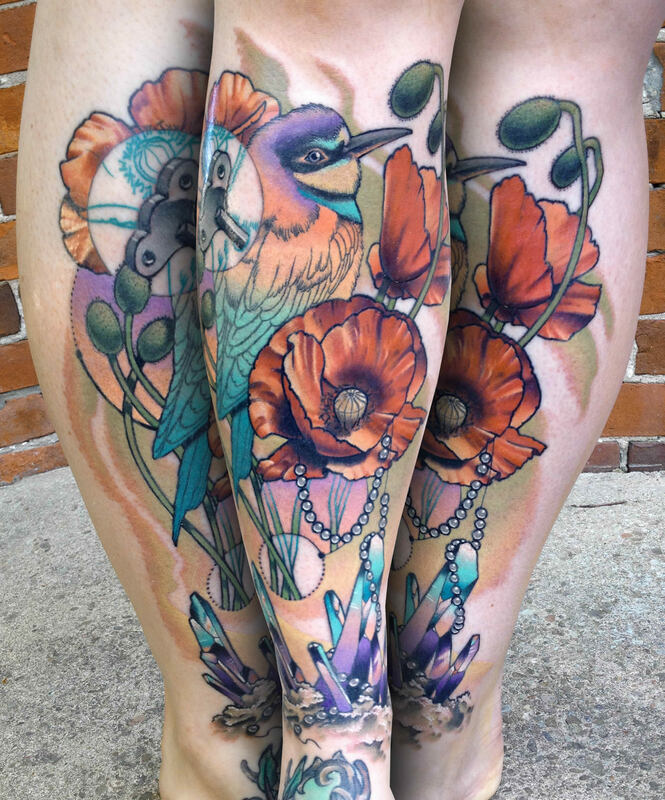 “Contemporary tattoos opened my mind,” as it did with so many young artists (and clients!). In just 10 months’ time, under the guidance of Rodrigo Tas, her technical skills and design compositions have just grown exponentially. French artist Knot isn’t new to the trade, but she is undergoing a major transformation. Her once child-like sketches and playtime scribbles are now maturing into tighter, cleaner works of art. Venturing into diverse themes, she’s tackling expressionism and surrealism this year. Pop art playtime isn’t gone forever; Knot will always have a playful side. Her range is just expanding now, with more complex and emotionally-driven designs. 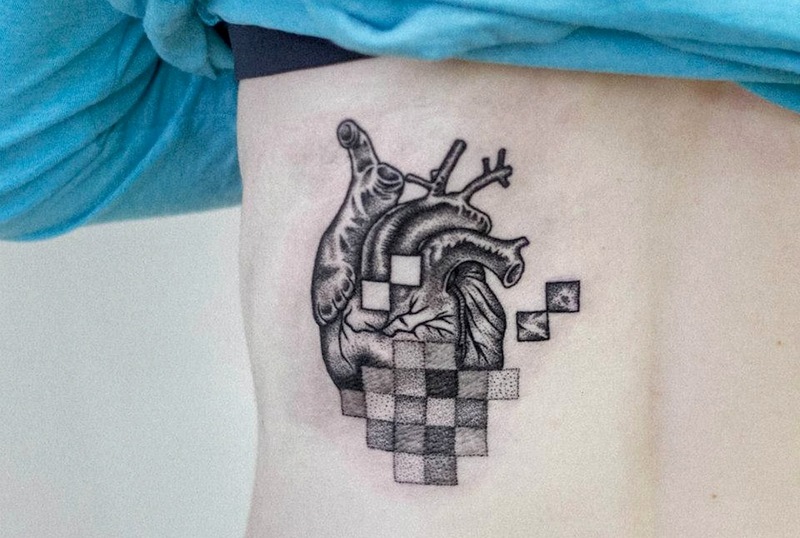 Pixelated heart tattoo by Uls Metzger (as 23Dogma). Uls Metzger, a.k.a. “23Dogma,” a.k.a. “acidouss,” admits to a split-personality brand identity. One side is somber, somewhat macabre, honoring folklore and sacred symbolism. The other is a secret cyberpunk! Loud colors, loud music, digital mash-ups and deconstruction. Yet, it’s all still somehow cohesive. 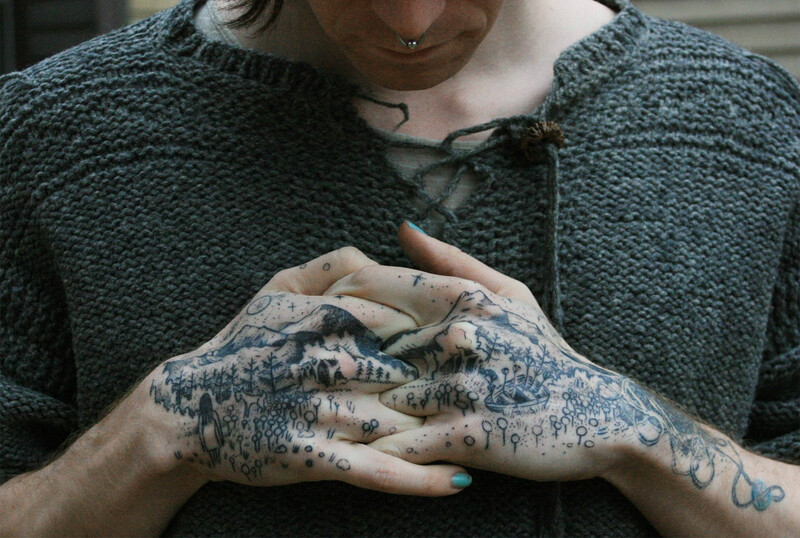 A tattooer for less than 6 months, driven by psychedelic spirituality, her work is bound to get only more interesting.